If your are looking for Altadena government, try here: Altadena Town Council. The bulletin board link there features meeting dates and times of the council and committees. Please visit the website of Altadena Community Children's Choir, a non-profit organization. Link courtesy of Bob West. In celebration of the arts, books and Altadena, the Friends of the Altadena Library will be hosting an art gallery event and sale at the Altadena Library from March 10 - 12. This event will invite Altadena artists to show and sell their work. The theme of this year is Art and Books, each artist asked to create a work that makes reference to literature or the art of book making. Contributing artists will include Philip Vaughan, Alice Vaughan, Lynne McDaniel, Carrie Henderson, Cory Sewelson, Catherine Bennaton, Zofia Kostyrko-Edwards, Charles Edwards, Mary Jane Elgin, Kayley Vernallis, Pietro Perona, JoAnn Formia, Mary K. Buck, Piper Head, Andrew Morrison, Jill Morrison, Diane Yamamoto Skowron, Catherine Cowles, Joseph Rohde, Karen Bagnard. A portion of the proceeds from the sale of the artists work will benefit the Altadena Library. Nestled in the foothills of the San Gabriel Mountains, Altadena is a picturesque retreat for anyone with an eye toward the arts. Craftsman, designers, architects and artists all seem to enjoy the rural country character and natural California landscape. The Altadena Library was designed by Architect, Boyd Georgi, and is a fine example of the Modernism movement in architecture. In 1919 Cecil B. DeMille established an airport adjacent to the Altadena Country Club. This may have been the motion picture industrys first introduction to Altadena as a bedroom community for movie making artisans. Western novelist Zane Grey bought the 1904 Woodward house near Marengo and Mariposa and architect Wallace Neff began his career in Altadena with the design and construction of St. Elizabeth Catholic Church. The relationship between artist and community has thrived in Altadena and continues to this day. Altadena Artists at the Altadena Library is a great opportunity to visit the library, see some terrific art and support the Altadena Librarys future growth. Reception: Friday, March 10, 7-9 P.M.
Open to the Public: Saturday, March 11, 11 A.M. - 5 P.M. Sunday, March 12, 1 P.M. - 4 P.M. Call for reservations. No, we will not send a car for you. Showtime: 8:00 P.M. Admission: $10. Planet Poetry sponsored by Nichelle Holliday. A compilation of readings, prose, poetry and various disciplines of music from mostly African-American artists of The Los Angeles Area. This is the sixth presentation of this show in the last two years. Very high quality presentation. Sunday October 13...5:00 P.M. Free. No Charge. Andrew Lorand In Concert to Record His Live CD With Special Guest Matthew Lee. Andrew is simply one of the finest songwriters we have ever heard, anywhere, anytime. His three studio CDs "Potsticker Rodeo," "Location,Location Location" and his project with songwriter/poet Matthew Niblock, "Puppets of Castro," showcase his unique gift for conveying the humor, pathos, absurdity, wit and beauty of everyday things. http://members.aol.com/mlband to open the show. Matthew's intense and intimate style has won him accolades from coast to coast. The recently released CD "Songbook" features 20 songwriters performing 20 of his songs. Pretty good recommendation for his music, eh? Saturday, October 19, 8:00 P.M. $10. Border Radio Tune in Border Radio for a good, old-time eclectic mix of country roots and cowboy swing. Lead singer Kelly McCune has a vocal purity "reminiscent of Patsy Cline and other twangy-voiced musicians of our past," according to Borders. She is accompanied by Mike Stromberg's dobro guitar and harmonies, along with Robert Staron on upright bass. Hip, fun and made in America. Plus: NOEL HARRISON, A troubadour whose concert and cabaret career spans five decades and three continents, Noel is the son of "My Fair Lady's" Rex Harrison. His hit recordings include "Suzanne", "A Young Girl" and the Academy Award winning "Windmills of Your Mind" for the soundtrack of the original "The Thomas Crown Affair". Harriet Shock famed for her song, "Ain't No Way To Treat A Lady," brings in her music, wit and charm to The Coffee Gallery Backstage Accompanying Harriet on bass, Joe Lamanno, on vocals, Corwyn Travers, Sally Zito, Herbie Katz on Harmonica, Tanya Winch on shaker. Plus Little Eden recording artist Bruce Michael Miller Before releasing his debut CD 'Already Somebody' Bruce Michael Miller was a studio and touring guitarist and vocalist. He has toured the world performing with such notables as Paul McCartney, Kenny Loggins, Laura Branigan, The Standells, John Densmore, and many others and has been part of many original bands and projects. His songs have been featured in motion pictures, performed internationally by other artists, and he has scored movie soundtracks. Friday, October 25 at 8:00 P.M. $10. Sourdough Slim That accordion playing, singing, funny guy who sings, tells tall tales, works a lariat all in cowboy garb. Alternately at The Coffee Gallery Backstage, Lincoln Center and Madison Square Garden. A star on both coasts. Fourth time back here. Sensational and funny. Ellen Stapenhorse and Steve Stapenhorse. Ellen and Steve Stapenhorst are real veterans in the acoustic music world. Steve has entertained for over three decades and his younger sister Ellen for almost as long. They appeared in concerts and clubs coast to coast, headlining and opening for major pop, country and folk acts. They both perform mostly original music. Ellen's is very personal and reflects a strong social conscience. Steve's songs usually go towards humor or stories. A mean finger picker on his own, he also adds a second guitar to Ellen's strong playing. Planet Poetry sponsored by Michelle Holiday. A compilation of readings, prose, poetry and various disciplines of music from mostly African-American artists of The Los Angeles Area. This is the sixth presentation of this show in the last two years. Very high quality presentation. John McEuen a founding member of the Nitty Gritty Dirt Band, McEuen is often called America's instrumental poet... his stellar playing brings us musical photographs from his travels around the world..." (Country Weekly) as he brings to the Coffee Gallery his guitar, banjo, mandolin, and fiddle to create "An absolute aural feast" (Billboard Magazine) with his "...thouroghly wacky and enjoyable performance" (Washington Post). His NGDB started here in Pasadena, with their first hit on KRLA in 1967 kicking off a music career that has taken John to over 4,000 different venues. Although a SoCal native, it has been said this innovator in Country Rock and Folk (he instigated the famous Will the Circle Be Unbroken album) has also created "...some of the most deft and impeccably tasteful music to come out of Nashville" (Chicago Tribune). http://www.johnmceuen.com will tell all, and if you go to this show, you will be telling many the next day "you should've been there!" Saturday, December 7. $10. Two shows: 7:00 & 9:00 P.M.
Scambooty , The Christmas Show Phenomenal, hysterical, awesome, extremely clever, intelligent, thoroughly approachable, amazing vocal power but enough about Attorney General John Ashcroft. Come kick off the Christmas Season with Scambooty's "Have a Bootyful Christmas" show. You won't believe your ears. Christmas songs with an irreverent twist, performed in a warm, homey, holiday setting like grandma's house without the flatulence This trio packs more punch than a 6-year old's birthday party, more laughs than a Gray Davis re-election campaign meeting and more fun than a weekend with Robert Downey Jr. A nifty trio doing irreverent stuff. Great hit last year. Will sell out. John Beland Saturday, December 28. Details T.B.A. Reservations: (626) 398-7917, regular business hours. If you have information about an upcoming event, please send email to have it posted it here. Please include a contact phone number so your event can be verified. If you would like to receive an email message whenever this page is updated press Subscribe. Check out the community link. Echo Mtn. Echoes is pleased to announce a brand new addition to the Mt. Lowe aficionado's library. This new book titled HISTORIC MT. LOWE A Hikers Guide to the Mt. Lowe Railway is written by San Dimas author Paul H. Rippens. This handy pocket sized soft cover guide includes a History of the Mt. Lowe Railway by John W. Robinson. Mr. Rippens takes the hiker to the trails of the Mt. Lowe Railway with easy to follow maps and instructions all highlighted by descriptions of the way things were during the mountain railway's heyday. Paul points out various ruins and relics along the trails left over from the 1890's to the late 1930's. The book contains over thirty pictures, some published for the first time and in the rear of this book is a Chronological History of the Mt. Lowe Railway. 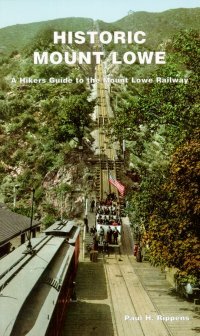 Adorning the front cover is a beautiful color picture of the Great Incline. The Echoes suggests getting two, one for the pack and one for the shelf. Price is $9.00 each + tax .74 cents + $1.50 shipping = $11.24. To order, follow this link. Tiny Tot Preschool - Monthly registration for children ages 3-5 may be placed at the office on weekdays between 2:30 and 6:00 p.m. Farnsworth County Park, 568 East Mount Curve Drive. $40.00 a month. Call (626)798-6335 for more information. every Monday, Tuesday, and Thursday from 2:50 - 3:30 p.m.
Go to the Bob Lucas Memorial Library & Literacy Center at 2659 N. Lincoln Avenue for homework assistance in math, reading, and English. Also, from 2:50 - 3:30 p.m. Grandparents and Books. For more information call (626)798-8338.
every Saturday and Sunday, from 8:00 - 9:30 a.m. Stress walk for adults and Seniors, at Farnsworth Park, 568 East Mount Curve Drive. Free. For more information call (626)798-6335. Altadena Library hosts "Teddy Bear Storytime." Pajamas and plush toys welcome. For more information call (626)798-0834.
the 3rd Monday of each month at 10:30 a.m.
Hill Toppers Garden Club of Altadena, meets at the Altadena Public Library, 600 East Mariposa Street. Altadena Library hosts "Preschool Storytime" featuring puppetry and music. For more information call (626)798-0834.
from 10:30 - 11:30 a.m.
Altadena Senior Center hosts "International Folk Dancing." Featuring Line and Circle dances. Beginner's are welcome. Located at 560 E. Mariposa Street, Altadena. For more information call (626)790-7383. Also held Thursdays from 3:00 - 4:00 p.m.
from 2:30 - 4:30 p.m.
Go to the Bob Lucas Memorial Library & Literacy Center at 2659 N. Lincoln Avenue for arts and crafts. For more information call (626)798-8338. Teen nights, at Farnsworth Park, 568 East Mount Curve Drive, for teens to work on homework, special school projects, plan activities and trips. Free. For more information call (626)798-6335. Altadena Senior Center hosts "Ballroom Dancing." Professional instruction provided and $3.00 charged for each class. The Altadena Senior Center is located at 560 E. Mariposa Street, Altadena. For more information call (626)798-0505.
from 3:00 - 4:00 p.m.
Altadena Senior Center hosts "International Folk Dancing." Featuring Line and Circle dances. Beginner's are welcome. Located at 560 E. Mariposa Street, Altadena. For more information call (626)790-7383. Also held Wednesdays from 10:30 - 11:30 a.m.
Go to the Bob Lucas Memorial Library & Literacy Center at 2659 N. Lincoln Avenue for Computer Shack and game time. For more information call (626)798-8338.
every Friday at 3:00 - 4:00 p.m.
Go to the Bob Lucas Memorial Library & Literacy Center at 2659 N. Lincoln Avenue for Video Friday. For more information call (626)798-8338.
every Saturday 2:00 - 3:30 p.m.
Abalaye African Dance Ensemble Sessions, at Loma Alta County Park, 3330 North Lincoln Avenue. All ages and all skill levels are welcome. $5 per class. Call (626)798-2341 for more information. The School of Self-Reliance hosts Naturalist Guided Hikes. For more information call (213)255-9502. Registration is now open for children K-6 to enroll on a weekly or daily basis for the 2:00 p.m. program. Transportation available from Pasadena and Altadena schools to the site location at Burbank Elementary. Activities include help with homework, arts and crafts, sports and recreation, self-development and social skills. Call (626)798-0862 extension 224 for more information.